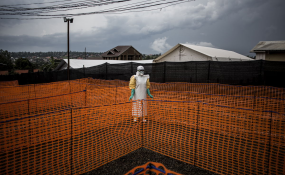 A health worker waits to receive a new unconfirmed Ebola patient at an MSF-supported treatment centre in Bunia (file photo). Home to nearly one million people, Bunia is the latest Congolese city to report an Ebola infection. The patient is a six-month-old baby, but authorities are baffled that its parents "appear to be in good health." The Democratic Republic of Congo's health ministry on Wednesday confirmed a case of the deadly Ebola virus in Bunia, the second-largest city in the country's east with a population of nearly one million people. The patient is a six-month-old baby. The health ministry said the parents "appear to be in good health." The ministry has launched an investigation to determine how the baby was infected. Public health authorities have recorded very few cases of infected babies. Given that Ebola is often transmitted by infected blood or body fluids, health experts generally believe babies, infants and children contract the virus through breast milk or close contact with infected parents. Congo has been hit with the second-deadliest outbreak of Ebola, with more than 600 people killed by the virus since last August. The worst outbreak was the 2013-16 epidemic in West Africa, which is believed to have killed more than 11,000 people. Emergency response teams have had a difficult time, in part due to poor security in the region and community resistance to their work. Several Ebola treatment centers have been attacked by gunmen, prompting Doctors without Borders (MSF) to suspend its activities. Ebola is a rare and highly infectious virus, with a death rate of up to 90 percent, according to the WHO. Symptoms include fever, intense weakness and vomiting. The incubation period range from two to 21 days.